I was invited by Sarah Milianta (@MiliLaff) to join her in the 14 Days of Teaching Love Challenge. This February challenge was created by TheGridMethod.com. It became a great way for me to reflect on my love of teaching while also sharing with my PLN! Here are my responses to the #14DaysofTeachingLove Challenge. Back on January 31, 2018, just a day before February began, @thegridmethod posted a fun challenge for educators, the 14 Days of Teaching Love Challenge. I ❤️ my PLN! @MiliLaff came across the challenge in her Twitter feed and shared it with her own PLN, me included! Of course, I had to accept! 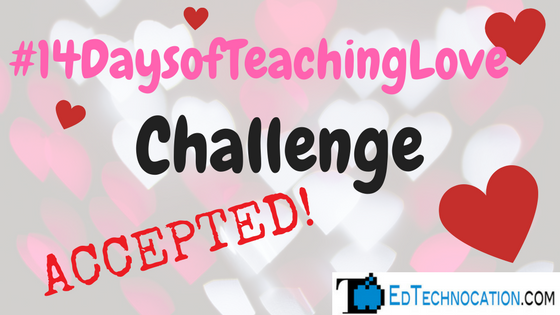 Check out the hashtag #14DaysofTeachingLove. It's never too late to share your ❤️ for teaching!